Keep it simple, but still make an impact with a square... or two or three. 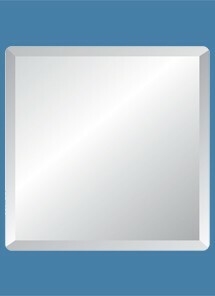 Square mirrors feature 1" Rounded Corners. The Square Frameless Mirror is one of the most classic designs that can be hung on it’s own or use multiple mirrors to arrange into a larger square or other decorative layout. There are four size options available. The small square mirror is 18” and also available in 24” 30” and the large size is 36”. This mirror is ¼ inch thick and made of high quality mirror glass featuring a 1” beveled edge which adds a smooth slight angle on the top edge of the mirror and is soft to the touch. The corners are rounded with a 1” edge as well. This traditional unframed decorative mirror comes with a vinyl safety backing 2 standard hooks & 2 adhesive bumpers bonded to the back and includes all of the hardware needed to properly hang the mirror on the wall. This elegant bevel edge wall mirror is perfect with any décor and versatile. Perfect for your bedroom dining room or hang this square unframed mirror above your bathroom sink for an elegant and modern look. With the right placement mirrors can instantly change a room by reflecting light and increasing the appearance of the space. This technique is used by interior designers and decorators to enhance the presence of a room. The most popular use for wall mirrors is for vanity but they are generally used as home accents and décor. We make shopping for frameless mirrors online easy by offering an extensive selection of top quality mirrors in all popular shapes sizes and various edges at affordable prices. Find every style to fit your décor needs including our modern mirrors traditional and contemporary classics. Our complete collection of mirrors is made from high quality mirror glass. They are expertly packaged and insured to ensure a safe arrival.